Broderick says he was destined to work at North Coast Brewing Company. As a senior molecular biology major at California Polytechnic State University at San Luis Obispo, he took up homebrewing -- a hobby he remembered his father enjoying in the '70s -- and decided that he wanted to make it a career. "I started sending resumes to all the breweries that existed on the West Coast," Broderick recalls. "I think I sent out more than 30 and one was to North Coast Brewing." Opened in 1988 by current brewery president Mark Ruedrich and co-founders Tom Allen and Joe Rosenthal, North Coast Brewing Company was already growing steadily in the early 1990s. However, Ruedrich informed Broderick that they didn't have any openings and he should check back later in the year. "I ended up taking a job at Anheuser-Busch in Los Angeles," Broderick continues. "It paid really well, but it was in the quality assurance department and wasn't actually brewing. I was also on call and often had to work the graveyard shift. It just wasn't exactly what I wanted to do." Three months in to the position, while stuck in traffic on Interstate 405, Broderick started thinking about scenic Mendocino County and the picturesque coastal town of Fort Bragg, with its population just north of 7,300 residents. "I figured there probably wasn't any traffic in Fort Bragg," he says, "and I wondered if North Coast Brewing had any openings yet." When Broderick got home, he found a note by the phone. "It said, 'Mark from North Coast Brewing called,'" he says, "and that's how I started my career back in 1992 as an apprentice here." To this day, North Coast Brewing has continued to grow, becoming the nation's 48th largest craft brewery in 2017. "I think we produced about 65,000 barrels that year," Broderick says. "We should be somewhere in the 70,000 barrel range this year. That's the kind of sustainable growth we've had since we started." Broderick says North Coast Brewing has about 18 varieties in production including 12 core brands that are available year-round. Their best seller, accounting for 35 to 40 percent of production, is Scrimshaw. "It's a pilsner beer that's easy to drink," he explains. "It's a good gateway beer for people who want to get into craft breweries." Old Rasputin Russian Imperial Stout is the brewery's second-best seller. Broderick says it accounts for 20 to 22 percent of production. Old Rasputin recently won a gold medal at the Tastings.com World Beer Championships, securing a 94-point score from judges. PranQster, a Belgian-style golden ale, makes up 8 percent of North Coast Brewing's production. Broderick develops new recipes on a pilot brewhouse that enables him to brew 15-gallon batches. "We have miniature versions of our cylindrical, conical, glycol-chilled big tanks," he says. "With that system, I can brew beer that is exactly the same as our production beer." Recent experiments have included a Berliner Weisse series and a hazy IPA, called Foggy Day IPA, which is slated to become a core brand in 2019. North Coast Brewing Company's production brewhouse is 50 barrels and computer automated. "That makes our brewing very consistent," Broderick says. It also features a Meura mash filter in the place of a traditional lauter tun. "A mash filter is a series of vertically arranged plates," Broderick explains. "It contains about 50 chambers but is only two inches thick. Because of the small diameter of the bed, we use a hammer mill to create flour-sized particles of grain for our mash." Wort is pumped through the mash filter and gently squeezed. "You end up with a very efficient yield of extract," Broderick continues. "That means you use less malt to create the same beer. It also conserves water, with virtually every drop of water that goes into the recipe becoming wort rather than effluent." Favorite beers: Simply put, anything he's brewing on the pilot system. "I've been really into German-style beers recently" Broderick says. "I brewed a smoked Märzen a couple times. I've brewed a doppelbock, which was inspired by the Spaten Optimator I used to drink in college. There's another German style called a schwarzbier. They're all on tap in my kitchen." Among North Coast Brewing Company's beers, Ruedrich's Red Seal is Broderick's favorite. "It's one of the original three beers that we produced when I first started working here," he says. "I call it without any hesitation the best beer in the world. If I could have only one beer for the rest of my life, that would be the one." Challenges: The brewery maxed out its fermentation capacity five years ago and has had to find creative ways to produce more beer in the space available, including a centrifuge to speed up separation of yeast and protein and move product through the fermenting tanks quicker. "If you can get the beer in and out quicker, you can make more beer in a calendar year," explains Broderick. "That was the first thing we did about 10 years ago." The mash filter has also sped up the production process. "With a traditional lauter tun, you have to wait on gravity to filter the liquid through the grain bed," Broderick explains. "With a mash filter, you pump the wort through. It used to take us six or more hours to brew 50 barrels of wort. We're now doing that in a little over one hour and can produce 500 barrels of wort in 24 hours." The brewery also added a new bottling line last year that can fill 250 bottles per minute. Combined with a new labeling machine, "we can package beer more quickly," Broderick says. "When you package the beer more quickly, bright tanks empty faster and you can filter the beer sooner. These are all bottlenecks in production that we've cleared to allow us to produce more beer within this plant." 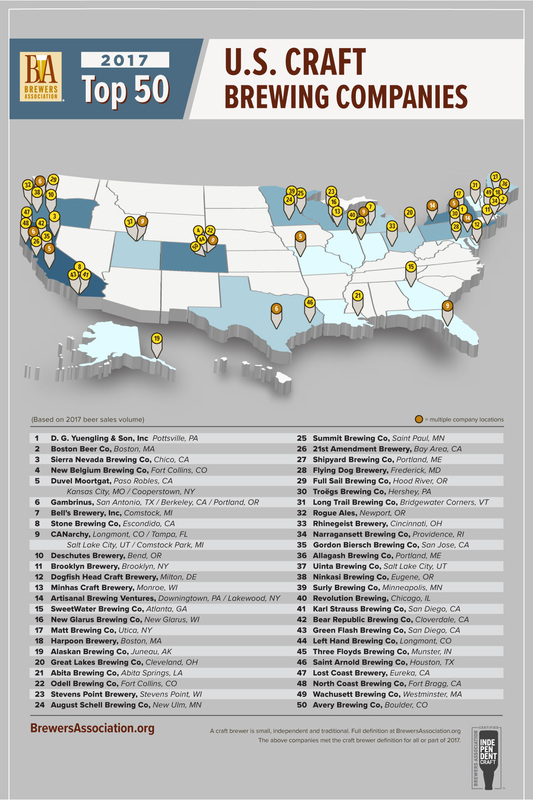 Opportunities: North Coast Brewing Company distributes to 48 states in the U.S. as well as Europe and the Pacific Rim. Broderick says the brewery is planning to focus additional efforts on chain store representation next year. "The future growth of the company is in chain stores like Costco, Target, and Safeway," he says. "Because we're in basically every state where these stores are located, we have a tremendous advantage over smaller breweries to expand that way." Needs: Broderick says the maximum brewing capacity at North Coast is 90,000 barrels "if we don't make any more changes. We're at about 70,000 now, so we're going to max this plant out very soon." North Coast Brewing Company's owners are actively looking into potential sites for a second production space, but no plans have yet been formalized.